Celebrate the tireless contributions of your children's teachers and coaches with a group gift that’s just for them. We make collecting money from any group of parents easy peasy, learn more here. 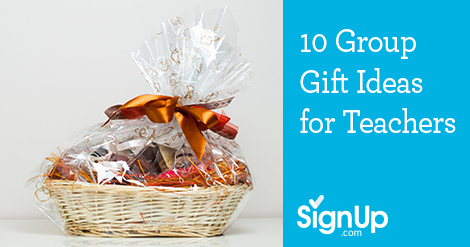 Use the funds to assemble a thoughtful group gift and/or a generous gift card. Check out these creative basket ideas that everyone can contribute to and deliver a warm thank you. Pro tip: It’s easy to organize donations of cash and basket items on SignUp.com. Movie Night! Microwaveable gourmet popcorn, a couple bottles of soda pop, a handful of funny and classic cinematic treasures and bam . . . you've created the perfect movie night! Top off with a gift certificate to a local movie theatre or Netflix coupons. Cook-ing Monster. Collect favorite recipes from classroom families and bind them together with ribbon. Include ready-to-make cookies or muffins-in-a-jar, a colorful reusable tote bag, a gift card to a specialty grocery store, personalized apron, cute measuring spoons - the ideas are endless! Music Mania! What's your teacher's favorite band or type of music? Make good for this music-lover with a Pandora or Spotify subscription. Consider getting tickets to a show they can attend over holiday break, and even have the class sing a holiday song on a recordable card to include in the gift basket. Sports Fan Club! If your teacher is a sports fanatic, hook them up with some fan-worthy gear! Include tickets to a game, favorite player jerseys or other sports memorabilia, a pennant banner for the classroom or even a holiday ornament with their favorite team's logo on it. Comfy & Cozy! Prep your favorite teacher for a warm night in with a gift basket full of goodies like gourmet hot chocolates and teas, cider, cozy slippers and a great fireside read. Spa Day! Keep it simple with gift certificates for a massage, manicure, pedicure, or blowout. Top off your gift basket with bath bubbles, salts, a loofah and body wash. Date Night. If you know your teacher is a busy mom herself, prep a super fun 'date night' basket; include fixings for an easy dinner (pasta, sauce, parmesan), a bottle of wine, a cute romantic movie, and delicious dessert . . . chocolate anyone? Clutter-Be-Gone! Help your favorite teacher get organized over break with helpful tools and supplies like notepads for grocery lists and menu planning; colorful personal schedulers and lesson planners look great wrapped up with a gift card on top too! Caffeine Fiend. Give your teacher a taste of the good stuff with a serious gift card to a coffee or tea shop (don't forget the shortbread and biscotti)! Keep them supplied with chocolate covered espresso beans too, and a personalized reusable mug for a final touch. Read All About It. Ask around and find out what your teacher loves to read. Fill your gift basket with a couple best-sellers, a personalized bookmark, a gift certificate to a local bookstore or online retailer, or even a subscription to a top literary magazine.